Because our Advan-Tex Motorcycle Covers are Custom Made we can accommodate any Top Box or Panniers you may have...You also get to choose the colour(s) of your cover. Each cover comes with elasticated corners and eyelets in the hem to allow you to lock or tie up the bike via the cover. We use double strength lap seamed stitching which enhances durability. We double stitch the seams for added strength and fold over the fabric where two pieces join to create an overhang, which enables water to 'run off' and significantly reduces any seepage at the point of the stitch, as well as strengthening the cover along the length of the seams. 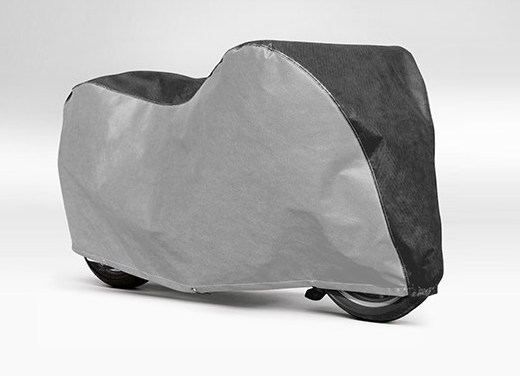 The Ultimate Outdoor Bike Cover, each one custom made to order.